There was plenty of news to be shared Monday morning; starting quarterback Adrian Martinez is day-to-day after a knee injury against Colorado, Nebraska is seeking a review of the play he was injured on and seven members of the defense got their Blackshirts. But there was also plenty of talk about what cost Nebraska the game Saturday. In his postgame press conference following the 33-28 loss, Frost pointed to a litany of mistakes that, if corrected, would have resulted in a different outcome. He doubled down on that Monday. So let’s run through a few. First mentioned was cornerback Dicaprio Bootle, who was beaten on a couple of deep balls from quarterback Steven Montez to wideout Laviska Shenault Jr. on Saturday. One of those proved to be the game-winner. Yet, on Monday, Bootle was the only member of the secondary who found a Blackshirt hanging in his locker. Graduate safety Tre Neal took most of the blame for the particular deep balls off Bootle, saying he had the right leverage and safeties didn’t provide enough help. Later on, perimeter blocking was brought up. There were a few option plays and a few bubbles which, if the Huskers had gotten a good block on the edge, would have gone for good yardage. “That’s got to be a big part of this game, when we get the ball outside it’s got to turn into yards and big plays for us,” Frost said. And when they break through that first level, it needs to be a house call. Frost said he thought guys might have been a little too amped and had a little too much adrenaline flowing that they became tight. “He knows it and I’m sure he’ll do a better job in the future,” Frost said. Nebraska spent all offseason finishing plays in the end zone, even if the ball-carrier was tackled, in order to build that mindset. Frost pointed out missed opportunities by the wideouts as well. 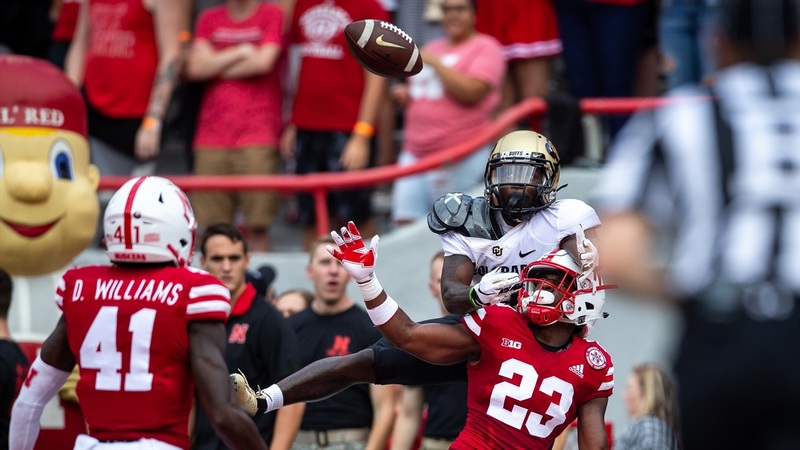 Nebraska’s two biggest offensive weapons — Stanley Morgan Jr. and JD Spielman — each dropped potentially-game-changing plays. Morgan dropped a touchdown in the end zone at the end of the third quarter. Spielman dropped a pass from quarterback Andrew Bunch late in the fourth quarter that would have given Nebraska a first down and kept the clock running. The offensive line played well. “It was pretty clear watching the tape we were the more physical team and won the battle on both sides of the line of scrimmage,” Frost said. But even they missed a protection that cost the Huskers a deep shot after a Colorado corner had fallen down. Special teams played “really well,” Frost said, but was penalized four different times. It all comes back to the same thing that was said Saturday night: Nebraska kept Nebraska from winning. Tape didn’t lessen the issues, it reinforced their impact. Frost wants to see those things get corrected, but he’s positive they will. “Every single player on the team did good things, every guy that played,” he started. “You can count mistakes that I made and the coaches made and just about every player on the team had one or two. >> Frost said he had two main goals going into the game: win and keep everyone, especially the quarterback, healthy. Neither was accomplished. “We’re all sick to our stomach about that,” he said. But there were positives. As much as he’s talked about the mistakes, Frost has made sure to praise his team. >> With Martinez’s status for Saturday’s 11 a.m. kick against Troy likely to hang in the air until close to gametime, backup quarterback Andrew Bunch will likely get as many reps as possible this week in practice. “Bunchy, when he’s gotten his opportunities, has done a great job. I was really pleased with how he performed when he came in,” Frost said. Whether it’s Martinez or Bunch running the show, Frost said things can't and won't change. >> On Troy, Frost was more than complimentary. “They’re a good team. Had a rough game [against Boise State in their opener], Boise had a lot of big plays against them otherwise it looked like a really evenly-matched game,” he said. “They’re well-coached, they wouldn’t have had the year they had last year without that. The Trojans are 1-1 with a 56-20 loss to the Broncos and a 59-7 win over Florida A&M on Saturday. They won 11 games a season ago behind a stout defense.